J.W. 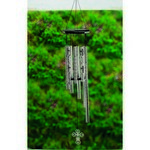 Stannard has long been recognized as one of the premier wind chime manufacturers. According to the most recent research, 85-percent of responding consumers bought J.W. 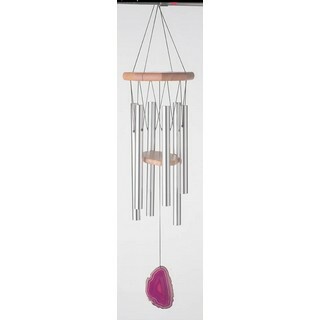 Stannard chimes because of the sound quality. 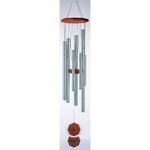 Each tube is tuned to ensure that every chime plays exactly the notes inscribed on the wind catcher. The sound is so precise, it is considered a musical instrument. 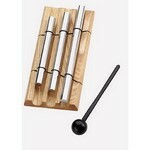 Each tube will maintain the chime's perfect pitch and never rust. 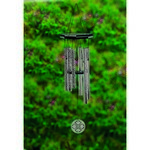 Protective nylon grommets are used on the chimes to minimize each cord's contact with each tube, increasing cord life and producing a clearer, cleaner sound. Removable hangers slip out to wrap around tree branches or any closed support. Diamond Line, the indestructible fiber used to tether satellites, holds the Stannard chimes together. The top is made from weather resistant hardwood and rubbed with three coats of marine varnish to preserve the natural luster.